Rumor has it that next year when Diane Feinstein runs for governor, Arnold Schwarzenegger will run for her senate seat. Honestly the possibility has excited me for a while. While he is definitely a moderate, he could win that senate seat, and a Republican pick up of that seat would be amazing. While I am tolerant of moderate Republicans occupying seats conservatives probably couldn't win, I can't stand moderates who undermine the Republican Caucus. Schwarzenegger's recent actions make me wonder if he might be another Specter in the U.S. Senate. Instead of spending this weekend at his own state convention working with his party to find solutions for the fiscal mess facing his state, the Governator is spending the weekend partying with Obama. It seems that an event like this is rather critical for any party leader to attend. Is Schwarzenegger focused more focused on media attention, or building his party? If he becomes a senator and undermines his caucus to get media attention, I'm not sure we want him there. This video is turning into quite the internet sensation. Rush picked it up, it appears there may actually be a Chicago Tea Party of sorts, and it even drew a White House response. Some have even jokingly suggested that if Roland Burris is forced to resign, Rick Santelli should be the next senator from Illinois. Who knows... With the talk of Joe the Plumber running for congress, maybe this could launch Rick on a political career. Last year's bailouts, supported by the Republican House and Senate leadership and signed into law by President Bush, spelled the death of capitalism. The more I think about it, it appears that this bailout is the death of federalism, or the idea that there should be separate levels of government. One of the major part of the Obama bailout is the bailout of the state governments. Now instead of being forced to face the tough decisions of how to balance their budgets, the states can now depend on the federal government. In Virginia we were facing the need for across the board budget cuts. When the bailout was passed, we decided we didn't have to cut back on any spending. This is the inverse of losing your job, your parents letting you move in, and then not getting a job above minimum wage since your expenses were minimal. A couple recent quotes help illustrate how bad this problem has become. The first comes from the governor's revenue figures. The second is from a recent e-mail from Sen. Obenshain concerning the budget process. As the Senate debated Virginia’s budget on Wednesday, several senators thanked certain of their colleagues and staff for their hard work and cooperation. One of my Democratic colleagues, however, stood and extended her thanks to thank President Barack Obama and to Congressional Democrats. She thanked them for the passage of the “stimulus bill,” asserting that it was only through their generosity that we were able to balance the budget without deeper cuts. It looks like the Obama administration might be bypassing the legislature in an attempt to unilaterally ban your second amendment rights. It looks like those who said the Obama Administration would strike while the iron is hot may have been correct, and the Administration may be doing it in a way that does not require them to even get a vote in Congress. In this morning's edition of the Shooting Wire, Jim Shepherd writes that Canadian officials have it on "good authority" our State Department may be on the verge of cutting off all imports of certain calibers of ammunition. Shepherd continues that there may also be a plan to ban exports on certain firearms to Canada from the US, resulting in the State Department hammering gun manufacturers, distributors and exporters in the United States while simultaneously making firearms -and ammunition - ownership and acquisition more difficult for Canadians. Many in the pro-rights community have said since the election that Obama could circumvent Congress by using regulations in his various cabinet departments to attack gun owners. It appears that it may have already begun. Senator Kirsten Gillibrand, the new junior senator from New York, is now coming under criticism from gun control activists for keeping two rifles under her bed. Liberals in New York criticized her selection as senator, because she was "too conservative." Congresswoman Carolyn McCarthy, a congresswoman who is planning on giving Senator Gillibrand a primary challenge in 2010 because Gillibrand is too conservative, was quoted on the issue as saying, "I hope the guns didn't have bullets in them." Congresswoman, I hope your pen doesn't have any ink in it, and your car doesn't have any gas in it for that matter. What good is a gun if there isn't any bullets in it? Senator Gillibrand was a blue dog democrat who voted against the Bush stimulus package, and has a very high rating from the NRA. I must say there is definitely something exciting thinking that a U.S. Senator believes in the second amendment and self defense enough to keep guns under her bed. The sad thing though, is that this is being used against her. If she were a republican from the Texas instead of a Democrat from New York this might guarantee her reelection instead of giving a primary challenger ammunition against her. Today the U.S. Congress passed a 787 billion stimulus bill. TheDemocrats finally agreed on a bill they liked last night, and passed the 1,071 page, 8 inch thick bill today. The bill passed the House of Representatives 246-183. Once again, every single Republican voted against it, and they were joined by a mere 7 democrats. This bipartisan bill received a grand total of three Republican votes in the entire U.S. Congress, the votes of three of the most liberal senate Republicans, who joined the Democrats and let them pass whatever they felt like. Without Senators Specter, Snowe, and Collins suporting the stimulus bill, it wouldn't have passed the senate. This clip from Boehner's floor speech against the stimulus bill illustrates the insanity of what our congress did today. It has been the greatest honor of my life to be able to serve and represent the citizens of eastern Prince William County in the House of Delegates, especially as the first Hispanic to ever serve in elected Virginia government. While it hasn't made me the most popular person in Richmond, I've always put principle over politics and partnered with anyone willing to place the people ahead of the special interests. I have worked day and night to provide honest, pro-active, responsive, and accessible representation to better the lives of those I represent. Also, I’ve doggedly kept my promises and have done what I said I'd do, even when it’s been difficult. In seeking that job, however, I promised that I would not seek re-election to the House if I were to win the Chairmanship. It is to you – my friends, supporters, and constituents who have made my journey thus far possible – that I wanted to let you know that I will be keeping this promise. I will not be seeking a fourth term in the House of Delegates. Jeff Frederick is scheduled to give a major speech tomorrow detailing his plans for his future. 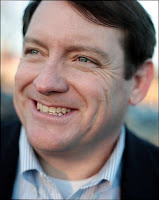 In light of the last couple e-mails Jeff has sent out, I'm sure it will be the retirement speech of a young star of the Virginia Republican Party. Thank you Del. Frederick for standing up for the cause of limited government, and the unborn. I'm sure your wife will take that seat well. In honor of the Fredericks, I am posting the video I took of Amy Frederick's speech at the RPV State Convention last May. At the end it cuts to the end of Jeff's speech where the whole family is on stage together. Would Ken Cuccinelli Really Have a Negative Effect on Bob McDonnell? As a blogger who is still neutral in the Attorney General primary, RedNova had some very good analysis on the claim that Cuccinelli will pull down Bob McDonnell. Its no great secret that Bob McDonnell would prefer to have John Brownlee on the ticket in November than Ken Cuccinelli, and so do many others. A recent quote from Loudoun Insider over at Too Conservative shares seems to be representative of the feelings many Brownlee supporters have. Its the idea that Ken Cuccinelli will bring the ticket down as a whole. Its a powerful sentiment and may give the other side some ammunition. But will KC actually drag down the ticket if the nominee? I am going to have to say no, and it has nothing to do with candidate preference. Its has been proven in political science that candidate up ticket in state wide elections has the ability to effect the performance down ticket (rare exceptions do happen, such as Mark Warner’s big margin of victory when compared to President Obama’s). We can look at the results of the 2005 gubernatorial election results to see what happens. Mr Kilgore managed to run such a awful campaign it cost him a 6 points loss in that election. But what happened down ticket? Bill Bolling and Bob McDonnell both won, but won by less than a full percent in both instances. Were they weak terrible candidates or did they suffer from a up ticket weight? Democrats love to point out that McDonnell and Bolling barely won in 2005, and that they are not as strong because of it. The fact they held off the “Kilgore effect” and still pulled it out really says something of the campaigners they are. Byrne and Deeds should be ashamed they couldnt ride the Kaine wave. But Bolling and McDonnell should have helped make it closer for Kilgore in accordance to the logic espoused by certain Brownlee supporters. At the end of the day, McDonnell’s performance in the general will be what sways voters to vote republican down ticket. You can make the argument that KC is too conservative too win state wide, but I do believe the idea he will hold McDonnell down is a little disingenuous. With that said. I am one of the few authors left on the blogosphere who is still choosing to remain neutral in this AG race, and It will take me a while before I fully endorse a candidate. But, I will be addressing some of the major arguments of all the campaigns over the next few weeks until I endorse somebody. After much speculation over whether or not Jeff Frederick would keep his promise and resign from the House of Delegates, we finally know the answer. Amy Frederick is running for delegate. It seems that for as long as I can remember, the rumor was that Amy Frederick would replace her husband when he moved on. 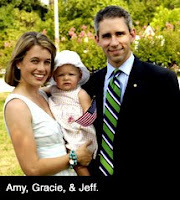 Recently Hampton Roads GOP reported that Jeff Frederick would run for reelection, and Bearing Drift predicted that Amy Frederick would be the one to run for the seat. Today a website was launched to draft Amy to run for Delegate, and Jeff Frederick is inviting people to sign the petition through RPV Network. We now no Jeff Frederick is a man of his word, and while people argued that if he became chair we would lose the seat, I think we have a very good chance of winning the seat. His wife is likable, smart, and knows the district well. For those who argue that she isn't running yet, but only being drafted, a draft campaign can be a very effective way to start off a campaign. One of Senator Cuccinelli's main legislative priorities this session was to create a Choose Life license plate. This plate would both allow people to show their support for the pro-life cause on their vehicles, and fund pregnancy resource centers around the commonwealth. In preparation for this legislative push, Ken collected signatures in support of the bill, and more than enough preregistrations for the license plates. The bill, SB 801, died in committee on a 6-6-2 vote. However Sen. Cuccinelli did not give up when his bill died in committee. Victoria Cobb of the Family Foundation put it best when she said, "Never one to surrender easily, today he successfully amended SB 817 to include his Choose Life plate." Yesterday, on a vote of 20-19, the amendment was approved, and the Choose Life plates are on their way to the House of Delegates where they will more than likely be approved. In recent weeks Brownlee has been using a line accusing Cuccinelli of siding with Tim Kaine on the death penalty in opposing the overturn of the triggerman law. Today, on the same day this rule was once again overturned by the House of Delegates, Cuccinelli issued a response to this charge in the Cuccinelli Compass. As we continue to travel the Commonwealth to participate in forums and debates, I welcome the opportunity to discuss directly with you my positions on the issues we face in Virginia. Unfortunately, in campaigns, sometimes our positions on important issues are deliberately distorted by others. For some time now, John Brownlee has deliberately distorted my position on the death penalty. As a candidate for Attorney General, I do not take distortions and misrepresentations lightly, and neither should you. Virginians have grown weary of distortions and half truths in politics, and unfortunately, this is not the first time this has happened in this race. The last time he did something like this, I called him on the phone and discussed it with him personally. But when these sorts of distortions continue, my response is not to distort things myself, but to point out my competitor's distortions. That let's you, the voters of Virginia, factor this information into your decision about who to support for AG. Let's face it, when you vote for someone for office, you get more than a package of positions, you get that person too. So you have the information yourself, I have always been a supporter of Virginia's death penalty law. In the Senate, I have consistently fought against Democrats' efforts to impose a death penalty moratorium - and I have opposed efforts to allow endless appeals in death penalty cases. As a State Senator, I have voted to extend the death penalty to people who murder trial witnesses, judges and law enforcement officers. And as your Attorney General, I am committed to upholding the death penalty verdicts of our juries and will work to defend and strengthen our capital punishment law from intrusions and attempts by the left to derail it. I also have supported and will continue to support the death penalty under the current exceptions to the "triggerman rule" for (1) terrorism (including the beltway sniper case), (2) murder for hire, and (3) criminal enterprises/gangs. However, there have been legislative attempts to completely eliminate the triggerman rule, which I believe would be too broad an expansion. That's the only expansion of the death penalty that I have ever opposed, while supporting other expansions and always defending our current death penalty statute. So the next time you hear John Brownlee or one of his surrogates giving a distorted rendition of my position supporting capital punishment, print this out and hand it to Mr. Brownlee. Here is the text of an e-mail sent out by the RPV this afternoon. It articulates the RPV's opposition to HB 1703.
operate a free enterprise and further alienate our Republican base. if not impossible, for many small businesses to operate in Virginia. flawed logic, particularly in an election year. principles and faithfully worked against this legislation. ready to win in 2009. You mean you're a pro-lifer who supports the death penalty? In recent weeks I have seen to run into a number of pro-lifers (either directly, or through articles) who believe capitol punishment is wrong. Not only do they oppose the death penalty, but they also believe that it is a contradiction to both oppose abortion, and support the death penalty. As a pro-lifer who supports the death penalty, I want to take this moment to explain why this position is not hypocritical, or illogical. This post is not meant to be a defense of the death penalty; in fact I will not deal with most of the traditional arguments on each side of the death penalty debate. All I will do in this post is show two ways I believe it is logical for someone to both oppose abortion and support the death penalty. As we begin, it is important to define what I mean when I say that I am pro-life. I believe that we must seek to recognize and defend the personhood of all people from "conception (and sadly fertilization) to natural death." This means that I recognize life as beginning at conception/fertilization, and we must protect this unborn life. The phrase "natural death" refers to defending the mentally retarded and aged from being euthanized, or otherwise having their lives cut short. At this point those that oppose the death penalty are thinking, "Ha if believes in protecting life till natural death then he will have to come to our side eventually." However this only leads to the first reason a pro-lifer should support the death penalty. If someone is taking lives, preventing people from living life till natural death, and their execution will save lives shouldn't pro-lifers advocate the death penalty? See really the death penalty is one way to protect the right to life. The second reason that the death penalty is compatible with the pro-life position stems out of the constitutional case against abortion found in the 14th amendment. The pertinent phrase in the constitution says, "Nor shall any state deprive any person of life, liberty, or property without due process of law." Abortion violates this clause because it deprives the unborn of life without due process of law. This phrase also assumes that people can be deprived of life if the due process of law is given. Nowhere in our legal system is more care taken before a sentence is given and carried out than when it comes to death penalty cases. It would be difficult to argue that due process is not given to those who receive the death penalty. In the same phrase in the constitution that should protect the unborn, we see the case for the death penalty. Life can not be taken without due process of law. This is a double edged sword in constitutional law that simultaneously protects the unborn and provides for the death penalty. It is quite logical for pro-lifers to support the death penalty. The death penalty protects life by making it impossible for murderers to take another life. The death penalty is also supported constitutionally by the same phrase that should make abortion illegal in America. All that said, what do you think? Am I nuts? If you have taken the time to read this entire article, I would love to hear what you think. I was just reading about the bailouts at Right.org, a group that’s asking Congress to do what’s right. Did you know that our government has committed $8.5 trillion to prop up failed companies? It’s crazy. Check out Right.org and their bailout calculator. When you do, please make sure you sign the petition. Today Rasmussen released a new likely voters poll for the Virginia Gubernatorial race. In the last Rasmussen poll on this race, Bob McDonnell lead Terry McAuliffe by 5%, was tied with Creigh Deeds, and was behind Brian Moran by 4%. Now McDonnell leads all three candidates: Creigh Deeds by 9%, Terry McAuliffe by 7%, and Brian Moran by 3%. Also McDonnell has the highest favorables, 50%, and the lowest negative, 18%, of either of the 4 candidates in the race. These are very good numbers for McDonnell, he is already leading, already has high favorables, and his opponents will probably have a bloody primary over the next few months. The irony in this poll is who Rasmussen says is declining in the polls. McDonnell’s and Moran’s numbers are largely unchanged from the earlier survey, while both Deeds’ and McAuliffe’s have deteriorated slightly. Many believed Moran would be on the decline with the near win of Joe Murray, and the entrance of Terry McAuliffe into the race. The race is likely to become clearer after the three men address the state Democratic Party’s annual Jefferson-Jackson Day dinner Saturday in Richmond. In the middle of January, Republicans came within 16 votes of winning Brian Moran's old House of Delegates seat in Alexandria. Tonight Republicans once again came within 1% of winning another NOVA special election, this one in Fairfax County. In the special election to elect a new Chairman of the Fairfax Board of Supervisors, the Democrats only won by about 1,200 votes out of over 100,000 votes cast. 10:04pm UPDATE: Herrity concedes. That’s two elections in a month in NOVA where GOP candidate has gotten within 1%. While many people will analyze what tonight's results say about the political direction of Virginia, I want to focus on the results from the precincts in Fairfax Co. that make up the 37th State Senate District. These results are particularly important because they are the best indicator as to how well a limited government principled conservative might do in a winter special election in this district. One of the criticisms of nominating Ken for Attorney General is that if he is elected the GOP will lose his senate seat. In an election we lost by a hair in Fairfax Co. as a whole, Herrity won by 13% in the 37th Senate District. Imagine a 13% win in a special election in NOVA next year, boy even winning by just half that much would be amazing. This race is the best indicator we have as to how a Republican will do in a special election in this district, and it indicates that a limited government conservative has a very good chance of winning this race. Electing Ken Cuccinelli as Attorney General doesn't mean we will lose the 37th District Senate Seat. "This morning I announced I will step down as your attorney general to become a full time candidate for governor of Virginia." This move will enable Bob McDonnell to focus all his time and energy on the governors race, without compromising the important work that is done in the Attorney General's office. Most importantly it will allow him to fundraise, something he is unable to do as an elected official during the legislative session. As far as a replacement, the Virginia state legislature will pick his replacement, and McDonnell is hoping it will be Chief deputy attorney general William C. Mims. Today voters in Fairfax Co. will go to the polls to elect a new Chairman of the Board of Supervisors for Fairfax County. This election has Pat Herrity running on the Republican side in a heavily democratic county. Following Joe Murray's 16 vote loss in Alexandria, another close loss or even a victory in Northern Virginia would definitely help boost Republican momentum heading into November's elections. Some speculate that with the recent election of Michael Steele as RNC Chairman, this race could also have national implications. If you know anyone in Fairfax County, please encourage them to brave the snow and get out and vote. If you are wondering what Patt Herrity stands for, Del. Bob Marshall wrote an excellent endorsement in his recent e-mail blast. Last week the $819 Billion Stimulus Bill came up for a vote in the House of Representatives, and it did not receive a single Republican vote. Eric Cantor, the man responsible for lining up those votes, did an excellent job explaining why he and his colleagues opposed the bill. While those were not enough votes, we have a chance to stop the bill in the senate this week. The Senate Republicans lead by Senators McConnell, and Kyl are opposing the bill, and seem to have the votes to block it. If we can hold this caucus together, and pick up a couple Democrat votes, we will be able to stop this bill. Please contact your senators as soon as possible, no matter what party they belong to, and urge them to oppose the stimulus bill. The number for the congressional switchboard is 202-224-3121.